There’s few investments that pay off more than home improvement. Whether you’re knocking down walls and redoing bathrooms, replanting gardens, or painting a few walls the satisfaction and value of improving your house is a rare satisfaction. No matter who you are, a better home contributes to a better life. This makes Home Depot gift cards a no brainer for many employee or customer reward programs. Versatile, useful, and practical, empower your loyal customers and employees to tackle the project they keep putting off. Home Depot is helping people do more with their hard earned money. From modest projects like updating your bath to small projects with a big impact like paint, The Home Depot can help you get more done in your home for less. That's the power of the world's largest home improvement retailer. The Home Depot. More saving. More doing. Gift cards may be redeemed at any The Home Depot stores and online. They never expire and no service fees will ever be charged when purchasing or using a The Home Depot gift card. 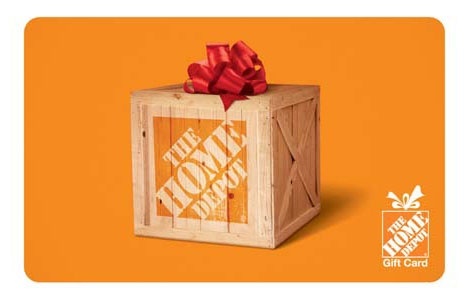 National Gift Card is the best place for you to order Home Depot gift cards in bulk. We are the experts in all things gift cards and can set up your gift card solutions program for you today. Please contact us for more information on The Home Depot bulk, direct-to-recipient, or individual gift card fulfillment for your gift card program. Contact us here or call us at 888-472-8747 today!